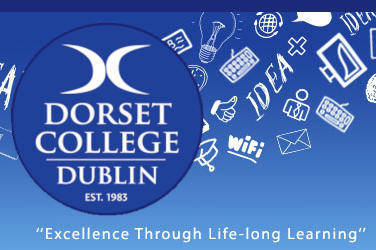 Established in 1983, Dorset College is an independent third level institution which is located in Dublin 1. The college has a long-standing reputation for excellence in teaching and learning with a strong focus on the provision of industry accredited programmes. These programmes offer good career and job prospects as well as being an ideal platform for academic progression. Dorset College provide excellent facilities and support to learners to enable them to achieve their goals. Students benefit from small class sizes, a diverse student community with a clear focus on high academic standards. Dorset College is a designated educational institute of Quality & Qualifications Ireland (QQI). The college is also accredited by CIPD, CISCO, Microsoft and CompTIA.